John Hodnett and Josh Wycherley celebrate in Colwyn Bay. 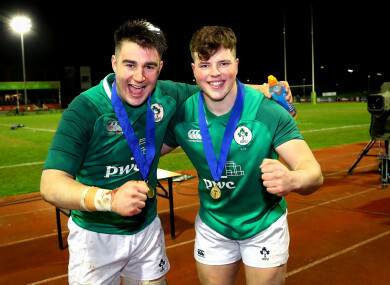 MUNSTER HEAD COACH Johann van Graan says he would happily fast-track some of his academy stars into first team action this season after they impressed in Ireland’s U20s Six Nations Grand Slam success. 12 Munster academy players were part of the Ireland squad that became just the second Grand Slam winners at that grade for the nation, and their progress has impressed van Graan. Prop Josh Wycherley – brother of Fineen – scrum-half Craig Casey and Jake Flannery were stand-out performers, while out-half Ben Healy also excelled in the win over France. While the coach won’t immediately propel his youngsters into action, he thinks they are ready whenever their chance materialises. “A lot of credit has to go to the Irish U20s and the work they’ve done not only this season but last season. The work that’s gone in behind the scenes for a number of years from Ultan O’Callaghan and Peter Malone, the development of those guys into the academy. I think the future’s so bright,” said van Graan. I think Josh Wycherley had an excellent campaign and Craig Casey, not only his energy but his decision-making was excellent. And the first day I saw Jonathan Wren train, I called him across and said ‘listen, you’ve got something very special’. “I think Jake Flannery has been excellent and I could name every single guy that’s played in the whole tournament, I’m really excited about them. Saturday’s clash with Zebre is the first opportunity for some of the latest crop of talent to force their way into the match-day squad, but already this season Diarmuid Barron, Gavin Coombes, Liam Coombes, Shane Daly and Sean O’Connor have been capped from the academy, while scrum-half Jack Stafford played three times last season under van Graan. “One guy I want to mention that wasn’t involved in this campaign but the previous campaign, Jack O’Sullivan just came back from a massive ACL injury, he’s been incredible in training,” said van Graan. “We’ve identified one or two guys who might possibly play PRO14 this season. The most important thing from my side is, I’ve been involved with a previous franchise in another country where players have won the U20 World Cup and come back in. A guy that springs to mind is Jan Serfontein. “I think the most important thing then is to put them between two other (experienced) guys so I’m going to use Craig Casey as an example: put Joey Carbery or JJ Hanrahan on his outside, and CJ Stander or Arno Botha on his inside. “So, first we’re looking at possibilities in the PRO14, then that USA trip (with Munster A) is going to be very important and then pre-season, really get them into training. Email “Van Graan sees bright future for Grand Slam-winners, but won't rush them into action”. Feedback on “Van Graan sees bright future for Grand Slam-winners, but won't rush them into action”.